CAMBRIDGE, Mass., Dec. 3, 2018 /PRNewswire/ -- Kymera Therapeutics Inc., a biotechnology company pioneering targeted protein degradation to create breakthrough medicines for patients, today announced research demonstrating preclinical activity of the company's first-in-class heterobifunctional small molecules to specifically degrade IRAK4 in MYD88 (myeloid differentiation primary response 88)-mutant lymphoma. Data were presented at the 60th Annual Meeting of the American Society of Hematology (ASH) in San Diego (Poster #2593, Session 625, Lymphoma: Pre-Clinical—Chemotherapy and Biologic Agents: Poster II). 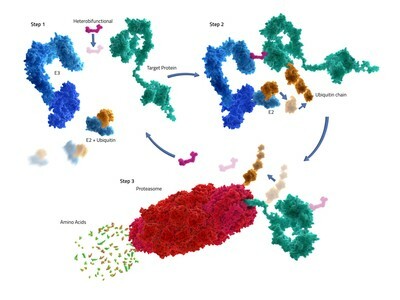 "This is an exciting milestone for the field of diffuse large B cell lymphoma (DLBCL) and validation of Kymera's Pegasus drug discovery engine to deliver novel heterobifunctional protein degraders," said Laurent Audoly, PhD, president and CEO, Kymera Therapeutics. "IRAK4 is a critical component of the Myddosome, a highly sought-after target implicated in the pathophysiology of multiple diseases including cancer, autoimmune and inflammatory disorders. Unlike conventional approaches that only inhibit IRAK4 kinase activity, Kymera's protein degraders eliminate both the kinase-dependent and -independent (scaffolding) functions resulting in superior and broader efficacy, providing a potentially transformative approach to the treatment of Myddosome-driven diseases including MYD88-mutant Lymphoma". Kymera's lead molecules potently induced ≥90% degradation of IRAK4 in two MYD88-mutant ABC (activated B cell) DLBCL cell lines, OCI-LY10 (DC90=180nM) and TMD8 (DC90=44nM). Degradation was highly selective for IRAK4 vs 10,000 other tested proteins as shown with state-of-the-art quantitative proteomics. Lead molecules provoked selective anti-proliferative and apoptotic effects within 48 hours. Once-daily dosing of Kymera's IRAK4 degrader for 2 weeks resulted in complete tumor regression and > 80% IRAK4 degradation in an OCl-LY10 mouse xenograft study. Kymera's IRAK4 degrader pharmacokinetic and pharmacodynamic properties within tumors support advancement toward clinical development in MYD88-driven lymphomas.